Bring a spark of elegance and beauty to your home decor with this designer mosaic floral candle holder. This is beautifully crafted with the excellent use of metal and glass. It is a beautiful art piece which is perfect for the side table. When you blow a candle in this holder the glass material used in the same will add a pinch of golden sparkle to your living room and giving you a magnificent view. It is designed with utmost care which offers adequate support to the candles and also brings value to your designer candles too. It is a great gifting idea which helps in asserting your emotions to you near or dear ones. It further helps in bringing peace to your home atmosphere. Candles are often called as a medium which allows us to connect with the almighty hence giving this beautiful base to your candle helps in providing you more calm and soothing experience at home. Thus the core of this holder is quite broad and strong; it offers efficient support. Well, use it with little caution especially if you have kids around you. 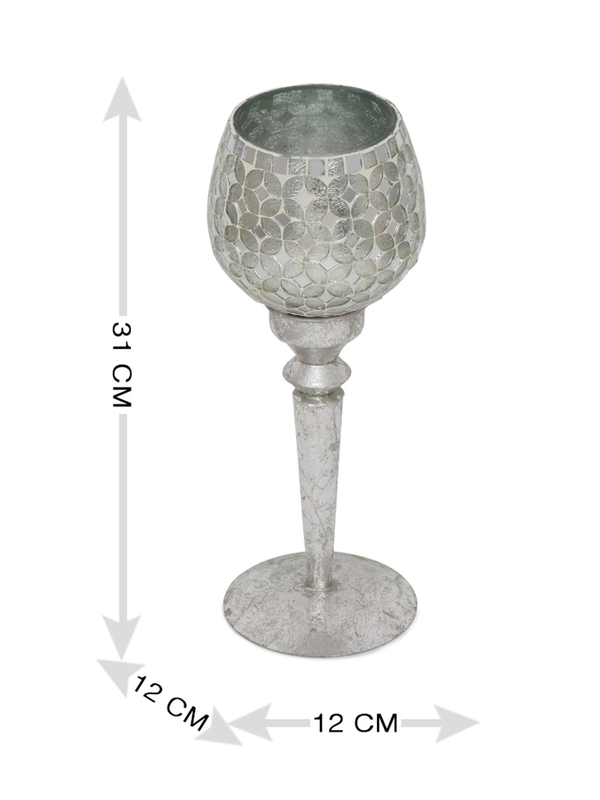 Add a source of energy and blessing to your living or bedroom with this mosaic floral candle holder, silver available only @home.